At certain points in our professional careers, we will need to reach out to our network for help. But especially if you’re an introvert, it isn’t always easy to grow and maintain a network that will be there for you when you need it. 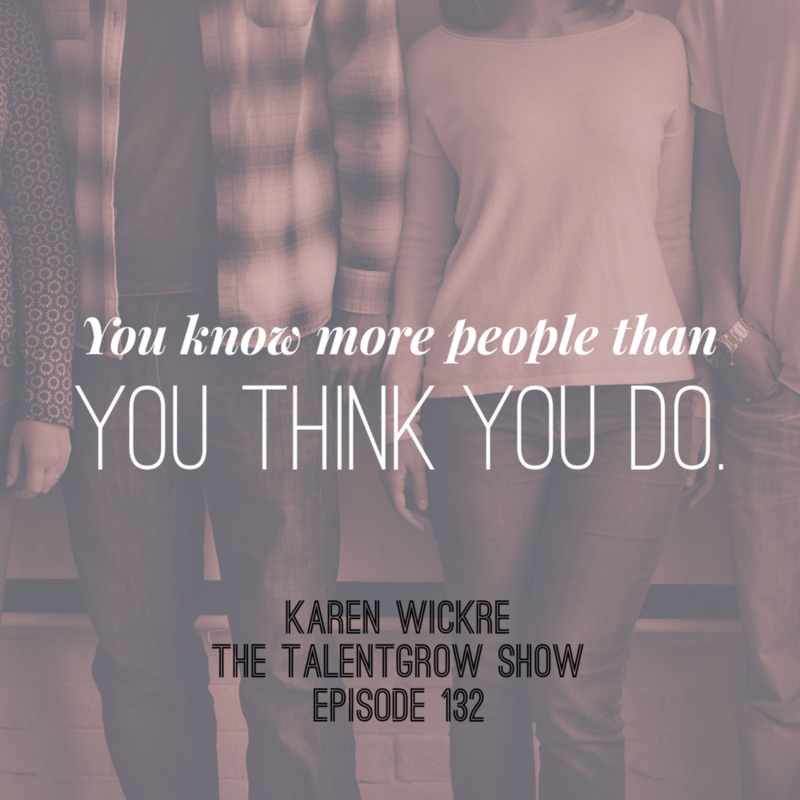 Author, advisor, and Silicon Valley veteran Karen Wickre joins me on this episode of The TalentGrow Show to share powerful networking advice backed by her own diverse and successful experience working at Google, Twitter, and beyond. An introvert herself, she believes that introverts hold more power than they think in the professional world. She has developed a set of eleven organizing principles that will help introverts (and just about anyone else!) master networking and make connections that count. Learn how to take the “work” out of networking by practicing techniques like the ‘play a long game,’ and by focusing on connecting with people you really like. Plus, find out how LinkedIn can contribute to a mindset of lazy networking. Listen and take a moment to share this episode with others in your network to keep those connections warm. TEASER CLIP: Karen: I observed over time that I think introverts have a leg up when it comes to genuine networking. Not the transactional business card trading kind, but when you’re really making connections. For one simple reason – introverts are good listeners. We don’t like to talk first. We like the other person to go first. So I think we’re better at asking questions to keep the other person talking. That way, we can learn more about that person and sort of gauge our level of interest and how much we want to reveal. It’s a wonderful skill to have. Halelly: Hey, hey, TalentGrowers. Welcome back. This is Halelly Azulay. I’m your leadership development strategist here at TalentGrow and this is the TalentGrow Show. 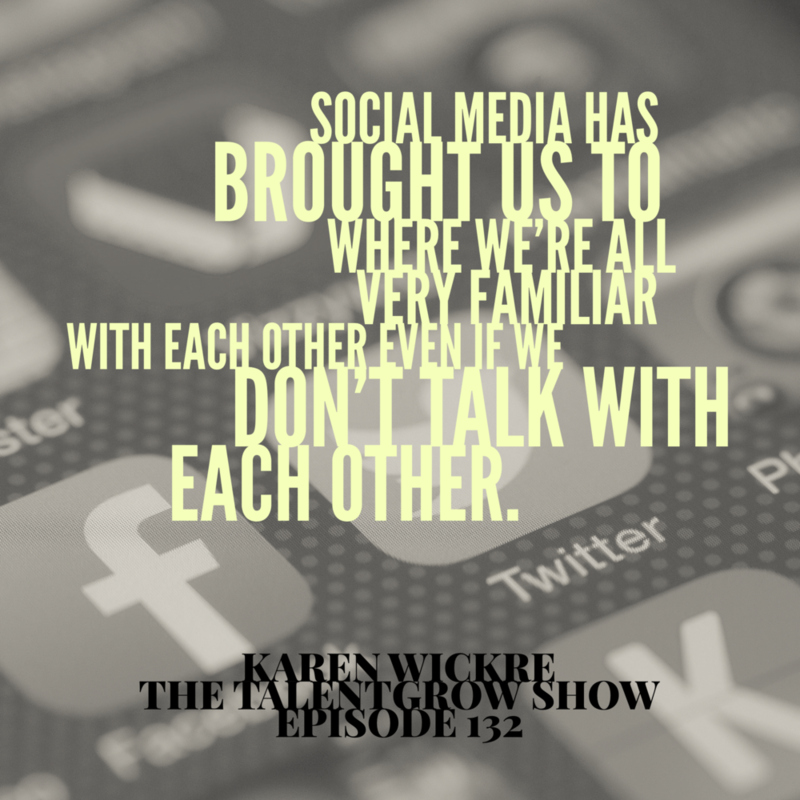 You know I love talking about networking without the ick factor, and I’ve got a great guest on today for you, Karen Wickre. She has an interesting background. She worked at Twitter and at Google and she has real life experience that has guided her to write a book about how to network in a way that takes the work out of networking. We have a really interesting conversation with super actionable advice, and I hope that you will enjoy it. I’d love to hear what you thought about it. Without further ado, let’s listen to my conversation with Karen Wickre. Okay, TalentGrowers. This week I have Silicon Valley veteran Karen Wickre. She is the former Editorial Director at Twitter, where she landed after a decade-long career at Google. An advisor to startups and a lifelong information seeker, she’s a member of the Board of Visitors for the John S. Snyder journalism fellowships at Stanford University and serves on the boards for the International Center for Journalists, the News Literacy Project and the Yerba Buena Center for the Arts. She has been a featured columnist for Wire.com and is a co-founder of Newsgeist, an annual gathering conference fostering new approaches to news and information. She is the author of Taking the Work Out of Networking, and lives in San Francisco. Karen, welcome to the TalentGrow Show. Karen: Thank you so much, Halelly. Halelly: I’m glad that you’re here and you have an interesting background which I’m looking forward to hearing a little bit more about. Before we get started talking about networking, which is the topic of your book and a topic of great interest to me, I always have my guests describe their professional journey briefly. Where did you start and how did you get to where you are today? Karen: That could be a whole other episode. But I’ll keep it shorter. I’ve lived and worked in San Francisco and around Silicon Valley for almost 35 years and fell completely by accident into the world of technology. When I first did, it was in the mid-80s and that world that I entered was the one of computer magazines. There were hundreds of them then, and things were booming because the personal computer revolution was going on. As we know, lots has changed, but I was kind of hooked on a combination of a fast-paced industry and all the great people I met, very few of whom had much background in technology at that time. There were lots of us liberal arts types who jumped in in the 80s and then hung on. That’s my story. Over time, I’ve written for consumer publications about the growth of the internet and the web. I’ve been a content site producer, I’ve been an editor in corporate environments, and then in the early 2000s, I did land at Google in the early years and there became the steward of the Google corporate blog and then the Google social accounts and all the other Google blogs that followed. That was a big, busy period. Eventually I moved onto Twitter, which had become a very interesting publishing platform and still is. I stayed there four years as Editorial Director and then went out on my own as an editorial consultant. My avocation all through this has been really building one’s personal network and having people to call on for all kinds of reasons all the time. I wrote the book, basically to describe the process I use, which I think is pretty painless compared to how people talk about how much they hate networking, traditional networking. I think I’m offering a better alternative for those who hate it. Halelly: Most people do. Most people say that. I also write and speak about networking a lot, and I often talk about networking without the ick factor. That’s how I try to teach people about it. In your book, Taking the Work Out of Networking, you say that introverts hold more power than they think in the professional world. I would say that at least half the population – maybe about half the population, a little less – are introverts, and since most people hate networking, and introverts tend to hate it even more, what makes that statement true? Tell us how introverts hold more power. Karen: Well, here’s my thinking about this. I, myself, am an introvert, meaning I’m not shy and I think this is a mistake people often make. Introverts aren’t necessarily shy, but we do gain our energy and kind of regroup to face the world by having quiet time to think and be alone and get away from the crowd. I definitely do that and then I go back out there and so I observed over time that I think introverts have a leg up when it comes to genuine networking. Not the transactional business card trading kind, but when you’re really making connections. For one simple reason – introverts are good listeners. We don’t like to talk first. We like the other person to go first. So I think we’re better at asking questions to keep the other person talking. That way, we can learn more about that person and sort of gauge our level of interest and how much we want to reveal. It’s a wonderful skill to have, to be able to listen, not just to wait your turn to talk but to actually encourage someone else to tell their story and reveal things about themselves. That’s one, listening. Related to this, but more about physical and visual effects would be the power of observation. I’ve always been a people watcher. I like to imagine the rest of their lives and who they are and what they’re doing, and so the power of observing someone’s style, their behavior, their demeanor – are they nervous? Are they anxious? Are they relaxed? Do they make other people comfortable? I think introverts are really attuned to sort of those kind of observational signals that people put off. Then third, sort of briefly and more broadly, the power of curiosity is a great one. Being curious, yes, about people, but also just about trying something new – introverts can do that just as well as extroverts. It may take more preparation time, but being open to new meetings, new ideas, new approaches, being curious about how things are the way they are and why they got that way. I think these three skills – listening, observing and being curious – are really powerful and I think introverts are in a better position to take advantage of those when it comes to meeting people and genuinely connecting with them. Halelly: I like that. Introverts already have a leg up, and those are totally available skills for any of us to build. It’s just that for extroverts, it takes probably a little more effort to move into those than for introverts? Halelly: Nice, I like it. And in your book, you describe 11 different organizing principles, you call them, of what you deem no-pressure networking. That sounds really great and we don't have time to cover all 11 in the 30 minute podcast, but I want to cover a couple of them and I looked them over and they all looked great. I thought we could talk about a few. One of them is what you call “play a long game.” What does that mean? Why is it important? How can our listeners incorporate that into their networking strategy? Karen: A long game is really the opposite of this idea of transactional networking where you say, “Oh my God, I need to find a new job because of whatever. I’m being downsized, I don’t like the new boss, I’ve got to get out of there. I’ve got to go meet somebody right now who is going to help me find a new job.” That’s sort of the panicky side, why people don’t like networking and that’s what the perception is. A long game is just the opposite – just to say as a matter of course throughout my days and weeks, I meet people when there’s no reason, when I don’t have a need to ask but I’m curious and want to meet somebody new that I’ve been introduced to or a friend who has said, “You two would really enjoy each other,” say yes to the meeting. Continue to make new contacts that you like and that you may have something in common with. That long game, those contacts, you don’t have to be in touch with them all the time, but they will eventually, some number of them, will turn out to be people that you can turn to when you have a specific need. “Oh, I know someone at that company who really enjoys it. I’m curious about that company. Let me get back in touch with them.” Or, “Oh, I know someone who took that trip or moved abroad or got that degree or took that course. I want to get in touch with them.” It’s kind of a long game of a growing number of contacts that you have as opposed to this sort of one-off transaction. That’s what I mean by long game. You continue to meet people, even if you’re in a nice, stable job for a long time that you enjoy. You still want to be open to making new contacts as they come along and as you’re curious about things. Halelly: That’s what gives networking a bad wrap. Those are the people that do it wrong because they turn the rest of us off so it just feels icky. Karen: That’s right, and there are very few encounters where you are meeting exactly the right person to help you land the job or get you the sponsorship or the partnership, whatever. It just doesn’t happen in a one-off. It’s like you’re putting together a jigsaw puzzle and this piece fits here and that leads me to this other piece. That’s the other part of it being a long game. Halelly: And if you are only waiting until you need something to start meeting people or asking for something, again, you’re not coming off as very generous. You’re not going to be very interesting to the people that you meet when you seem so needy, and you’re in a much better position if you’re thinking about the long game, which means you need to be connecting and maintaining relationships all the time, not just when you need something, so that when you need something, those people are primed and ready and eager to help you, because you’ve not come across their radar as only the person who talks to them when they need something. Karen: I could not have said that better! Thank you. That encapsulates so much of what I’m talking about. Halelly: We are of the same mind, I can totally tell when I read your book. Yes, a kindred spirit! I love it. One other organizing principle I wanted to ask you about, you say is don’t under communicate. I’m curious to hear more about that. Karen: This has to do in part with, well, either introductions or when you’re seeking information. Let’s say you’re interested in a new company or a company that seems to be doing interesting things and you’d like to know more about it. Under communicating would be your email or your message to someone saying, “Can I talk to you? I’d like to get together.” Or, “Can I buy you a cup of coffee?” That’s not quite enough information. It might be to someone you’re friendly with, but you might want to say a little bit more about, “Here’s my thinking. Here’s what I’m interested in,” because it could be that person is not the right one, but they’ll say, “Oh, you actually need to talk to so-and-so. Let me introduce you over here.” In any case, think about when you get such request messages – don’t you want more context? Give a little context when you’re doing it. Likewise, if you’re introducing someone, don’t just hand off the person via email and say, “You two should meet.” You have to say, “Here’s why. I like this person, I just met them. I want you to meet them because you know more about so-and-so that they’re interested in, at your convenience. I hope you two can get together.” Then there’s something people can decide if they want to act on or, again, say, “I could do a phone call,” or, “I can’t do it for a week,” or whatever. But without that, there’s not much interest, I think, or people are too busy to just say, “Yeah. Why am I getting together? Sure.” You want a little more communication. That’s what I mean by that. Halelly: Clearly you come from a journalism perspective, so you understand that you need to tell your audience what’s in it for them. People just don’t do it, it’s amazing. I don’t know if it’s laziness or ignorance or what. Halelly: Add a personal note! Karen: That’s good to do, because otherwise we probably have all kind of ignored those. Why does this person want to connect with me? The more you can just say a sentence or two about why, that isn’t just, “We have common interests,” but maybe what those common interests are. Just a little bit more. Halelly: Yes. Totally, I’m with you. I love that in your book you talk about something else I also kind of preach about which is the double-opt-in introduction. You just described if you want two people to meet, you should give them some background, and what you didn’t just say but you wrote in your book, in addition, tell them that background separately so you’re not putting them on the spot to force them to connect when it’s not a good fit. Karen: Absolutely. I’m religious about this. I meet people who say, “Look, I’m new to town.” This happens to me all the time and I say, “Okay, I can think of three people. Let me write to each of them with a little about you. When they say okay, I’ll introduce you.” They almost always say okay. Very few people say no when you, who have the contact, explain, “This is someone interesting and they’re hard-working and they’re curious about so-and-so.” They say yes and then schedule it at their own convenience. It’s not an immediate thing. It can never be a demand like that. You absolutely have to do that. It’s the only polite thing to do. Halelly: Exactly. It’s polite, courteous. It just amazes me. I used to do that. I used to not know, I didn’t understand about that. The minute I learned about the double opt-in introduction I was like, “Oh, that makes so much sense,” and I changed my ways since then. Just yesterday I got one, again, really well meaning. I know it was well meaning and this person not only offered an introduction, but she offered me to have a call with them. That put me way more on the spot because now I can’t even just answer politely in the email and say, “Great, nice to meet you,” and blow it off. I have to now somehow explain to them why I don’t want to take the time to meet with them if I don’t, and that’s awkward. Halelly: Do you go back to people – I call it the hot potato introduction – do you reprimand them or teach them or just leave it alone and say they obviously don’t know? Karen: You know, that is a good question. I haven’t always gone back to them. It kind of depends who they are and how well I know them. I only have one or two friends who have done that to me sort of with a surprise kind of intro with the other person on, and I think, “The next time I talk to them, I’m going to say something,” but honestly I don’t always, which is not good advice for other people. Halelly: Well, it’s a little bit awkward, because you don’t want to come across as holier than thou or slapping them on the wrist when they did something well intentioned. Karen: Of course. It’s always well intentioned. Halelly: Always. If we have time we’ll talk about it more, but one other organizing principle I pulled up out of your 11 is the value of weak ties. I certainly have been reading a lot about that. It’s interesting. For our listeners, explain please, what are weak ties and how can we leverage them for opportunities and mutual value creation? Karen: Weak ties are essentially the people who you know less well and you’re not in touch with, maybe you’ve known in the past, maybe you worked together previously or went to school together, or even a passing acquaintance – friends of friends type – that you might be connected on LinkedIn or possibly Facebook, but they’re not anywhere kind of near your inner circle. But these are the people who sometimes have the best, most useful information for some reason. If you are in touch, occasionally. Again, you don’t have to make them best friends, but to kind of essentially broaden the base for when you have a question. If your question is about looking at a new kind of position or you want to learn more about taking a new role or changing industries or something like that. It’s often not your friends or family or your immediate circle that will know, but it’s someone else further out, your weak ties. So, there are two things about that. One is, there’s a real benefit to staying in loose touch with these people, which is easy to do frankly on something like LinkedIn, or if you have people you follow on Twitter that are mutual follows or something like that, or occasional email. Sometimes you can get reintroduced to someone or just look them up and say, “I’ve been following what you’re doing or I see you just joined a new company,” or whatever. The thing is, they’re fair game because of all these platforms we now have to reach out in the appropriate way, and LinkedIn makes that somewhat pretty easy, to say, “We haven’t been in touch. I remember the days we worked together. May I ask you this? May I call you about this? Could you send me information at your convenience?” Always at your convenience, no deadlines, about so-and-so that I’m interested in. Because these are often the people that say, “I remember you too. I remember that time well. Yes, I’d love to talk about what I’m doing now or this company,” because people are always recruiting. These people you don’t think of that are not top of mind are sometimes the best part of your network, a really valuable part of your network. Karen: I’ll tell you, just in my immediate experience of having some interviews and some articles about me and the book, which I will then post on LinkedIn, separate post on Twitter, separate post on Facebook, I’ve heard from people who I worked with more than 10 years ago. We have not been in touch in 10 years. And they will say not just congratulations – which would be nice and I of course welcome that – but, “Now that I see your name, now that you’re top of mind for five minutes, I have a question for you. I want to ask you about so-and-so. Can we arrange a call or talk over email?” It’s interesting. It doesn’t mean you have to make news, but if you’re posting on a blog or on media or something about what you’re doing or what your interests are, sometimes people pop up because of that, because we now have this infrastructure of various social platforms. It’s fair game to reach out, then, to people who are weak ties. Halelly: I should do a whole episode just on that. I totally think that’s a value that many people don’t understand about social media in general, and I’ve seen that firsthand as well, that people come out of the woodwork and they know stuff about me because I share a lot. Some people like to think that I share too much, I don’t know, but they certainly feel like they’re in touch with me. It’s usually one-sided because they’re lurking and they don’t share back and don’t say anything about themselves, so it’s always catching me off guard when they’re like, “I know you sent to such-and-such last week,” and I’m like, “Are you following me?” No, you put it on Facebook. Karen: This is what social has brought us. We’re all very familiar with each other, even if we never talk to each other. Halelly: But it’s nice, because it keeps us nice and warm. Your weak ties are warm, not hot, but you’ve got something to base the conversation from. You said the words that I think are so important. It keeps you on their radar. Keeps you top of mind. Then if they know what you’re good at and what you like and what you do and what value you offer, because you’ve kept it top of mind for them, then they’re more likely to think of you and connect the dots between you and an opportunity or you and another person than someone who isn’t on their radar at all. Halelly: Nice, good. Well, gosh, Karen, there’s so much more we can talk about, but we don’t have enough time, so before you share one super specific actionable tip, what’s new and exciting on your horizon? What project or discovery has your attention these days? Karen: This book has taken me into all kinds of interesting places, where people are asking for workshops, for example, and I must say, so much of what I described in the book and everything, and the way I think about this stuff, is so one-to-one, I’m having sort of fun and sort of a challenge to think about how do you engage a group of people in a room in doing something together, even though it’s about their one-to-one contacts? I haven’t got that figured out, but it is taking my time and attention and it is very interesting to think about that, especially for people who might be introverts and maybe don’t want to have a group exercise. Halelly: Yes, interesting! Well, let me just say, this is what I do for a living, so I’m happy to help you if you want. Share some tips and insight. Karen: We’ll talk about that. Halelly: If that’s something that’s interesting to you and you want to try it, it can be very rewarding. That’s cool. Well, kudos and good luck with that. What’s one specific actionable tip that you’d like to share with listeners, something that they can do today, tomorrow, this week, to take their networking skills to the next level? Karen: I would say get in touch with a few friendly people from your past. Like we were saying, weak ties. It can be people you worked with and liked. People will often tell me, “How do I get started and I don’t have a network.” Well, you know more people than you think you know. If you’re feeling intimidated about it, reach out to people who are your former colleagues. Again, people you liked, not everybody you worked with. But people that you liked, just to get caught up with them and make it two, three, four of those people over the course of the next few weeks. You will be rewarded by that conversation and that catch up and it’ll open your mind to new possibilities for yourself, for them, and you’ll feel more connected. Halelly: I love that. Let’s concretize it. I hear you, Karen, I want to take action on what you just suggested and you said reach out and get in touch. What specifically should I do? Should I email them? Should I send them a message on LinkedIn? And if however message I send them, should it just be to converse via the message platform or should I ask them to have a call or a meeting? What do you say? Karen: I would say the way you get in touch depends on where you see them. If they are on LinkedIn and you are, that’s fair game to start. If you’re on Facebook or Instagram, simply say hello there and to say, “I’d love to catch up with you.” It could be phone or a video chat. If you’re both local and you’re near each other, say, “Can we have coffee sometime?” That’s also great. It doesn’t have to be in person, but some way that goes beyond the platform, ideally. Unless you’re both prolific writers, which not that many people are. It’s to have some one-to-one conversation, in some fashion, based on where you are connected to them, if that makes sense. And then follow up. Halelly: So your pitch, your reason that you’re suddenly out of the blue reaching out, what you present this as, is to say, “Hey, I was thinking about you. It’s been a really long time since we talked. Would you be interested in catching up by phone?” Like something like this? Halelly: If you can use something real specific as kind of the conversation starter? Halelly: Great. That was helpful. I appreciate that. I know people are going to want to read your book – we’ll link to it in the show notes, and where can people learn more from and about you Karen? Karen: My website is just my name, KarenWickre.com. I’m also very active on Twitter @kvox, and of course I’m on LinkedIn. I’m not hard to find, in other words, in all of those places. Halelly: And it sounds like you’re friendly and interested in conversing with people, so it’s probably going to be a fruitful endeavor if they do. Karen: Thank you, I hope so, and it will be for me too. Halelly: Excellent. I really appreciate that you took time from your busy schedule to spend some time with us on the TalentGrow Show and share your insights, Karen. Thank you. Karen: Thank you, I really enjoyed it. Halelly: Okay, TalentGrowers. I hope that you enjoyed this episode and I hope that you will take action, the action that Karen suggested, and get in touch with a couple of people. I might feel a little bit scary, but I think that you will be rewarded richly from the surprisingly easy effect of connecting and getting back in touch with someone that you cared about. Don’t get back in touch with the people that you didn’t like – just leave them alone! But the people you cared about, that you liked, it’s going to feel really nice when you reconnect, and they’re going to be really delighted and surprised to hear from you. Do that. It’ll give you a feel-good boost after you get over the freak out factor. I’d love to hear how that went. Definitely leave a comment in the show notes, or send me an email or contact me on social media or leave me a voicemail. I’d love to hear from you, and in general, I always welcome your feedback so do get in touch. Let me know what you want to hear about in the future and what guests you suggest. Thanks for listening. I appreciate you. I’m Halelly Azulay, your leadership development strategist here at TalentGrow, and this has been the TalentGrow Show. Until the next time, make today great.